How Do Bees Find Flowers? The survival of a bee colony depends on the bee's ability to find flowers containing food. The bright color and sweet aroma of certain flowers acts as natural attractants for bees. Bees use a combination of eyesight and sense of smell to identify flowers with the pollen and nectar they need to survive. Pollen is a bee's food source, and in order to eat, a bee must be able to locate flowers containing pollen. Additionally, finding flowers filled with nectar allows a bee to make honey, an important bee byproduct. According to Vilas Land and Water, honeybees and native bees serve as the earth's leading pollinators of plants, and this process only occurs after a bee has found and eaten from a plant. Bees are able to see blue, green and violet. They also have the unique capacity to see ultraviolet light patterns, which are invisible to the human eye. Bees use the color patterns found in the petals of flowers and the ultra violet light to determine the presence of both pollen and nectar. If the ultraviolet light is not present, bees become disinterested in searching for flowers. According to Bee Source, bees use scent to identify the specific sweet flowers that contain ample amounts of food. They also leave their scent on the flowers that they have already visited. When other bees detect the scent, they avoid this particular flower and land on another one. 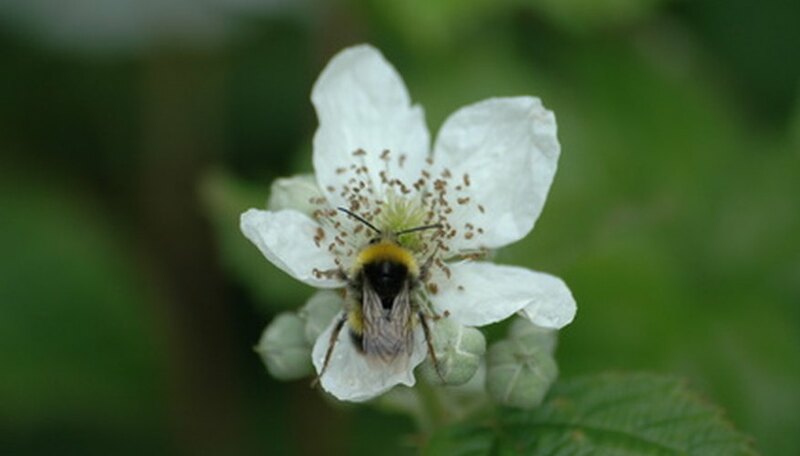 Bees can also deposit a slightly different scent on flowers that have an abundant amount of food, allowing fellow bees to visit and consume the rest of the food. Scout bees forage for food and once found, the scouts will communicate the find to other bees in the hive by performing a tail-wagging dance. According to the website Polarization, scout bees carry the scent of the flowers on their body, and this coupled with the dance allows the other bees to locate the flowers. When dancing, the bee flies in a straight line to specify the direction where the food can be found. The rapidity at which the dance is repeated indicates the distance of the food from the hive. Smog and exhaust obscure a bee's ability to smell, and increased pollutants in the air can make its search for flowers difficult or impossible. Without the aroma, bees are forced to rely on eyesight alone to locate flowers. Why Do Flowers Have Pleasant Smells and Bright Colors?